Opposite to a DAC, this dedicated A2D converter transfers your vinyl to PC with the highest quality possible via the MM or MC cartridge. Pro-Ject A/D Box S2 MM and MC A2D Converter has been designed as an affordable, effective tool for digitally archiving your precious analogue media. It has USB output for recording to a computer and additional line input. Being able to take digital audio back-ups of vinyl records or analogue tapes allows you to preserve your precious music, and also take some of your favourite analogue-only tracks with you on the go. By recording to a computer you can also use special software tools to remove unwanted pops, clicks or crackles. 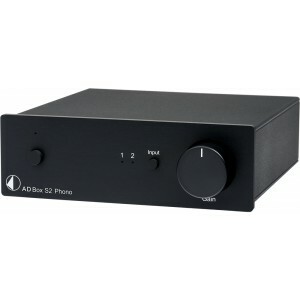 The A/D Box S2 Phono achieves this by converting Phono or Line level inputs to a digital USB data stream for a Windows, Apple or Linux computer to handle. Once a source is connected into the back panel, the input selector on the front panel allows for easy changing between connected devices. At the same time as the music is transferred to USB, it's also possible to continue listening via the RCA analogue outputs - effectively allowing A/D Box S2 Phono to double-up as an input extender for an existing hi-fi system, while also acting as an MM/MC phono stage built on the same design principles as Pro-Ject's coveted Phono Box model. The Gain control on the front panel is only for the digital data stream. Many computer soundcards struggle with loud audio inputs - the gain attenuator on the A/D Box S2 Phono allows you to adjust this level - striking the best possible balance between convenience and fidelity.